This article is about the company. For the web browser, see Netscape (web browser). Netscape is a brand name associated with the development of the Netscape web browser. It is now owned by Verizon Media, a subsidiary of Verizon. The brand belonged to the Netscape Communications Corporation (formerly Mosaic Communications Corporation), an independent American computer services company, whose headquarters were in Mountain View, California, and later Dulles, Virginia. The browser was once dominant but lost to Internet Explorer and other competitors after the so-called first browser war, its market share falling from more than 90 percent in the mid-1990s to less than 1 percent in 2006. Under AOL, Netscape's browser development continued until December 2007 when AOL announced that the company would stop supporting the Netscape browser as of early 2008. As of 2011, AOL has continued to use the Netscape brand to market a discount Internet service provider. Netscape Communications is now part of America Online (AOL). AOL initially envisioned the Netscape Web site as a Web portal, providing a source of revenue through advertising and e-commerce. After the antitrust ruling found that Microsoft had held and abused monopolistic power, Microsoft settled with AOL for $750 million. As part of the settlement, AOL gained the rights to use and distribute Internet Explorer. Entrepreneur Jason Calcanis leveraged the Netscape brand to create Propeller, a social bookmarking and news site similar to Digg.com. Netscape Communications wants you to forget all the highway metaphors you've ever heard about the Internet. Instead, think about an encyclopedia—one with unlimited, graphically rich pages, connections to E-mail and files, and access to Internet newsgroups and online shopping. Netscape was the first company to attempt to capitalize on the nascent World Wide Web. It was founded under the name Mosaic Communications Corporation on April 4, 1994, the brainchild of Jim Clark who had recruited Marc Andreessen as co-founder and Kleiner Perkins Caufield & Byers as investors. The first meeting between Clark and Andreessen was never truly about a software or service like Netscape, but more about a product that was similar to Nintendo. Clark recruited other early team members from SGI and NCSA Mosaic. Jim Barksdale came on board as CEO in January 1995. Jim Clark and Marc Andreessen originally created a 20-page concept pitch for an online gaming network to Nintendo for the Nintendo 64 console, but a deal was never reached. Marc Andreessen explains, "If they had shipped a year earlier, we probably would have done that instead of Netscape." The company's first product was the web browser, called Mosaic Netscape 0.9, released on October 13, 1994. Within four months of its release, it had already taken three-quarters of the browser market. It became the main browser for Internet users in such a short time due to its superiority over other competition, like Mosaic. 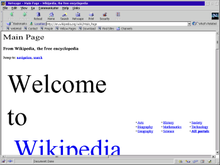 This browser was subsequently renamed Netscape Navigator, and the company took the "Netscape" name (coined by employee Greg Sands, although it was also a trademark of Cisco Systems) on November 14, 1994, to avoid trademark ownership problems with NCSA, where the initial Netscape employees had previously created the NCSA Mosaic web browser. The Mosaic Netscape web browser did not use any NCSA Mosaic code. The internal codename for the company's browser was Mozilla, which stood for "Mosaic killer", as the company's goal was to displace NCSA Mosaic as the world's number one web browser. A cartoon Godzilla-like lizard mascot was drawn by artist-employee Dave Titus, which went well with the theme of crushing the competition. The Mozilla mascot featured prominently on Netscape's website in the company's early years. However, the need to project a more "professional" image (especially towards corporate clients) led to this being removed. 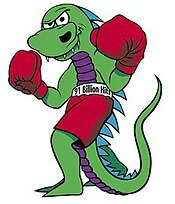 The original green and purple Mozilla mascot, a Godzilla-like lizard which represented the company's goal of producing the browser that would be the "Mosaic killer"
On August 9, 1995, Netscape made an extremely successful IPO. The stock was set to be offered at US$14 per share, but a last-minute decision doubled the initial offering to US$28 per share. The stock's value soared to US$75 during the first day of trading, nearly a record for first-day gain. The stock closed at US$58.25, which gave Netscape a market value of US$2.9 billion. While it was somewhat unusual for a company to go public prior to becoming profitable, Netscape's revenues had, in fact, doubled every quarter in 1995. The success of this IPO subsequently inspired the use of the term "Netscape moment" to describe a high-visibility IPO that signals the dawn of a new industry. During this period, Netscape also pursued a publicity strategy (crafted by Rosanne Siino, then head of public relations) packaging Andreessen as the company's "rock star." The events of this period ultimately landed Andreessen, barefoot, on the cover of Time magazine. The IPO also helped kickstart widespread investment in internet companies that created the dot-com bubble. Netscape advertised that "the web is for everyone" and stated one of its goals was to "level the playing field" among operating systems by providing a consistent web browsing experience across them. The Netscape web browser interface was identical on any computer. Netscape later experimented with prototypes of a web-based system which would enable users to access and edit their files anywhere across a network, no matter what computer or operating system they happened to be using. This did not escape the attention of Microsoft, which viewed the commoditization of operating systems as a direct threat to its bottom line, i.e. a move from Windows to another operating system would yield a similar browsing experience thus reducing barriers to change. It is alleged that several Microsoft executives visited the Netscape campus in June 1995 to propose dividing the market (an allegation denied by Microsoft and, if true, would have breached antitrust laws), which would have allowed Microsoft to produce web browser software for Windows while leaving all other operating systems to Netscape. Netscape refused the proposition. Microsoft released version 1.0 of Internet Explorer as a part of the Windows 95 Plus Pack add-on. According to former Spyglass developer Eric Sink, Internet Explorer was based not on NCSA Mosaic as commonly believed, but on a version of Mosaic developed at Spyglass (which itself was based upon NCSA Mosaic). Microsoft quickly released several successive versions of Internet Explorer, bundling them with Windows, never charging for them, financing their development and marketing with revenues from other areas of the company. This period of time became known as the browser wars, in which Netscape Communicator and Internet Explorer added many new features and went through many version numbers (not always in a logical fashion) in attempts to outdo each other. But Internet Explorer had the upper hand, as the amount of manpower and capital dedicated to it eventually surpassed the resources available in Netscape's entire business. By version 3.0, IE was roughly a feature-for-feature equivalent of Netscape Communicator, and by version 4.0, it was generally considered to be more stable on Windows than on the Macintosh platform. Microsoft also targeted other Netscape products with free workalikes, such as the Internet Information Server (IIS), a web server which was bundled with Windows NT. Netscape could not compete with this strategy. In fact, it didn't attempt to. Netscape Navigator was not free to the general public until January 1998, while Internet Explorer and IIS have always been free or came bundled with an operating system and/or other applications. Meanwhile, Netscape faced increasing criticism for the bugs in its products; critics claimed that the company suffered from "featuritis" – putting a higher priority on adding new features than on making them work properly. This was particularly true with Netscape Navigator 2, which was only on the market for five months in early 1996 before being replaced by Netscape Navigator 3. The tide of public opinion, having once lauded Netscape as the David to Microsoft's Goliath, steadily turned negative, especially when Netscape experienced its first bad quarter at the end of 1997 and underwent a large round of layoffs in January 1998. Later, former Netscape executives Mike Homer and Peter Currie described the period as "hectic and crazy" and that the company was undone by factors both internal and external. January 1998 was also the month that Netscape started the open source Mozilla project. Netscape publicly released the source code of Netscape Communicator 4.0 in the hopes that it would become a popular open source project. It placed this code under the Netscape Public License, which was similar to the GNU General Public License but allowed Netscape to continue to publish proprietary work containing the publicly released code. However, after having released the Communicator 4.0 code this way, Netscape proceeded to work on Communicator 4.5 which was focused on improving email and enterprise functionality. It eventually became clear that the Communicator 4.0 browser was too difficult to develop, and open source development was halted on this codebase. Instead, the open source development shifted to a next-generation browser built from scratch. Using the newly built Gecko layout engine, this browser had a much more modular architecture than Communicator 4.0 and was, therefore, easier to develop with a large number of programmers. It also included an XML user interface language named XUL that allowed single development of a user interface that ran on Windows, Macintosh, and Unix. The slogan for this open sourcing effort, "Free The Lizard", carried comedic sexual overtones. The United States Department of Justice filed an antitrust case against Microsoft in May 1998. Netscape was not a plaintiff in the case, though its executives were subpoenaed and it contributed much material to the case, including the entire contents of the 'Bad Attitude' internal discussion forum. In October 1998, Netscape acquired web directory site NewHoo for the sum of US$1 million, renamed it the Open Directory Project, and released its database under an open content license. On November 24, 1998, America Online (AOL) announced it would acquire Netscape Communications in a tax-free stock-swap valued at US$4.2 billion. During this time, Andreessen's view of Netscape changed; to him, it was no longer just a browser, intranet, extranet, or a software company, but rather an amalgamation of products and services. By the time the deal closed on March 17, 1999, it was valued at US$10 billion. This merger was ridiculed by many who believed that the two corporate cultures could not possibly mesh; one of its most prominent critics was longtime Netscape developer Jamie Zawinski. The acquisition was seen as a way for AOL to gain a bargaining chip against Microsoft, to let it become less dependent on the Internet Explorer web browser. Others believed that AOL was interested in Netcenter, or Netscape's web properties, which drew some of the highest traffic worldwide. Eventually, Netscape's server products and its Professional Services group became part of iPlanet, a joint marketing and development alliance between AOL and Sun Microsystems. On November 14, 2000, AOL released Netscape 6, based on the Mozilla 0.6 source code. (Version 5 was skipped.) Unfortunately, Mozilla 0.6 was far from being stable yet, and so the effect of Netscape 6 was to further drive people away from the Netscape brand. It was not until August 2001 that Netscape 6.1 appeared, based on Mozilla 0.9.2 which was significantly more robust. A year later came Netscape 7.0, based on the Mozilla 1.0 core. During the acquisition of Netscape by AOL, joint development and marketing of Netscape software products would occur through the Sun-Netscape Alliance. The software, in the newly branded iPlanet, included "messaging and calendar, collaboration, web, application, directory, and certificate servers", as well as "production-ready applications for e-commerce, including commerce exchange, procurement, selling, and billing." In March 2002, when the alliance was ended, "iPlanet became a division of Sun... Sun retained the intellectual property rights for all products and the engineering"
On July 15, 2003, Time Warner (formerly AOL Time Warner) disbanded Netscape. Most of the programmers were laid-off, and the Netscape logo was removed from the building. However, the Netscape 7.2 web browser (developed in-house rather than with Netscape staff, with some work outsourced to Sun's Beijing development center) was released by AOL on August 18, 2004. After the Sun acquisition by Oracle in January 2010, Oracle continued to sell iPlanet branded applications, which originated from Netscape. Applications include Oracle iPlanet Web Server and Oracle iPlanet Web Proxy Server. The Netscape brand name continued to be used extensively. The company once again had its own programming staff devoted to the development and support for the series of web browsers. Additionally, Netscape also maintained the Propeller web portal, which was a popular social-news site, similar to Digg, which was given a new look in June 2006. AOL marketed a discount ISP service under the Netscape brand name. 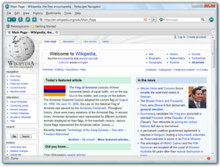 A new version of the Netscape browser, Netscape Navigator 9, based on Firefox 2, was released in October 2007. It featured a green and grey interface. In November 2007, IE had 77.4% of the browser market, Firefox 16.0%, and Netscape 0.6%, according to Net Applications, an Internet metrics firm. On December 28, 2007, AOL announced that on February 1, 2008 it would drop support for the Netscape web browser and would no longer develop new releases. The date was later extended to March 1 to allow a major security update and to add a tool to assist users in migrating to other browsers. These additional features were included in the final version of Netscape Navigator 9 (version 9.0.0.6), released on February 20, 2008. Netscape Navigator was Netscape's web browser from versions 1.0–4.8. The first beta versions were released in 1994 and were called Mosaic and later Mosaic Netscape. Then, a legal challenge from the National Center for Supercomputing Applications (makers of NCSA Mosaic), which many of Netscape's founders used to develop, led to the name Netscape Navigator. The company's name also changed from Mosaic Communications Corporation to Netscape Communications Corporation. The browser was easily the most advanced available and so was an instant success, becoming a market leader while still in beta. Netscape's feature-count and market share continued to grow rapidly after version 1.0 was released. Version 2.0 added a full email reader called Netscape Mail, thus transforming Netscape from a single-purpose web browser to an Internet suite. The main distinguishing feature of the email client was its ability to display HTML email. During this period, the entire suite was called Netscape Navigator. Version 3.0 of Netscape (the first beta was codenamed "Atlas") was the first to face any serious competition in the form of Microsoft Internet Explorer 3.0. But Netscape easily remained the number one browser for the time being. Netscape also released a Gold version of Navigator 3.0 that incorporated WYSIWYG editing with drag and drop between web editor and email components. Netscape 4 addressed the problem of Netscape Navigator being used as both the name of the suite and the browser contained within it by renaming the suite to Netscape Communicator. After five preview releases in 1996–1997, Netscape released the final version of Netscape Communicator in June 1997. This version, more or less based on Netscape Navigator 3 Code, updated and added new features. The new suite was successful, despite increasing competition from Internet Explorer (IE) 4.0 and problems with the outdated browser core. IE was slow and unstable on the Mac platform until version 4.5. Despite this, Apple entered into an agreement with Microsoft to make IE the default browser on new Mac OS installations, a further blow to Netscape's prestige. The Communicator suite was made up of Netscape Navigator, Netscape Mail & Newsgroups, Netscape Address Book and Netscape Composer (an HTML editor). In January 1998, Netscape Communications Corporation announced that all future versions of its software would be available free of charge and developed by an open source community, Mozilla. Netscape Communicator 5.0 was announced (codenamed "Gromit"). However, its release was greatly delayed, and meanwhile, there were newer versions of Internet Explorer, starting with version 4. These had more features than the old Netscape version, including better support of HTML 4, CSS, DOM, and ECMAScript; eventually, the more advanced Internet Explorer 5.0 became the market leader. In October 1998, Netscape Communicator 4.5 was released. It featured various functionality improvements, especially in the Mail and Newsgroups component, but did not update the browser core, whose functionality was essentially identical to that of version 4.08. One month later, Netscape Communications Corporation was bought by AOL. In November, work on Netscape 5.0 was canceled in favor of developing a completely new program from scratch. In 1998, an informal group called the Mozilla Organization was formed and largely funded by Netscape (the vast majority of programmers working on the code were paid by Netscape) to coordinate the development of Netscape 5 (codenamed "Gromit"), which would be based on the Communicator source code. However, the aging Communicator code proved difficult to work with and the decision was taken to scrap Netscape 5 and re-write the source code. The re-written source code was in the form of the Mozilla web browser, on which, with a few additions, Netscape 6 was based. This decision meant that Netscape's next major version was severely delayed. In the meantime, Netscape was taken over by AOL who, acting under pressure from the Web Standards Project, forced its new division to release Netscape 6.0 in 2000. The suite again consisted of Netscape Navigator and the other Communicator components, with the addition of a built-in AOL Instant Messenger client, Netscape Instant Messenger. However, it was clear that Netscape 6 was not yet ready for release and it flopped badly. It was based on Mozilla 0.6, which was not ready to be used by the general public yet due to many serious bugs that would cause it to crash often or render web pages slowly. Later versions of Netscape 6 were much-improved (especially 6.2.x was regarded as a good release)[who? ], but the browser still struggled to make an impact on a disappointed community. Netscape 7.0 (based on Mozilla 1.0.1) was released in August 2002 as a direct continuation of Netscape 6 with very similar components. It picked up a few users, but was still very much a minority browser. It did, however, come with the popular Radio@Netscape Internet radio client. AOL had decided to deactivate Mozilla's popup-blocker functionality in Netscape 7.0, which created an outrage in the community. AOL reversed the decision and allowed Netscape to reinstate the popup-blocker for Netscape 7.01. Netscape also introduced a new AOL-free-version (without the usual AOL add-ons) of the browser suite. Netscape 7.1 (codenamed "Buffy" and based on Mozilla 1.4) was released in June 2003. In 2003, AOL closed down its Netscape division and laid-off or reassigned all of Netscape's employees. Mozilla.org continued, however, as the independent Mozilla Foundation, taking on many of Netscape's ex-employees. AOL continued to develop Netscape in-house (with help from Sun's Beijing development center), but, due to there being no staff committed to it, improvements were minimal. One year later, in August 2004, the last version based on Mozilla was released: Netscape 7.2, based on Mozilla 1.7.2. After an official poll posted on Netscape's community support board in late 2006, speculation arose of the Netscape 7 series of suites being fully supported and updated by Netscape's in-house development team. This was not to be. Netscape Navigator 9's features were said to include newsfeed support and become more integrated with the Propeller Internet portal, alongside more enhanced methods of discussion, submission and voting on web pages. It also sees the browser return to multi-platform support across Windows, Linux and Mac OS X. Like Netscape version 8.x, the new release was based upon the popular Mozilla Firefox (version 2.0), and supposedly had full support of all Firefox add-ons and plugins, some of which Netscape was already providing. Also for the first time since 2004, the browser was produced in-house with its own programming staff. A beta of the program was first released on June 5, 2007. The final version was released on October 15, 2007. AOL officially announced that support for Netscape Navigator would end on March 1, 2008, and recommended that its users download either the Flock or Firefox browsers, both of which were based on the same technology. The decision met mixed reactions from communities, with many arguing that the termination of product support is significantly belated. Internet security site Security Watch stated that a trend of infrequent security updates for AOL's Netscape caused the browser to become a "security liability", specifically the 2005–2007 versions, Netscape Browser 8. Asa Dotzler, one of Firefox's original bug testers, greeted the news with "good riddance" in his blog post, but praised the various members of the Netscape team over the years for enabling the creation of Mozilla in 1998. Others protested and petitioned AOL to continue providing vital security fixes to unknowing or loyal users of its software, as well as protection of a well-known brand. On June 11, 2007, Netscape announced Netscape Mercury, a standalone email and news client that was to accompany Navigator 9. Mercury was based on Mozilla Thunderbird. The product was later renamed Netscape Messenger 9, and an alpha version was released. In December 2007, AOL announced it was canceling Netscape's development of Messenger 9 as well as Navigator 9. Netscape Collabra Server, a NNTP news server acquired in a purchase of Collabra Software, Inc. Between June 2006 and September 2007, AOL operated Netscape's website as social news website similar to Digg. The format did not do well as traffic dropped 55.1 percent between November 2006 and August 2007. In September 2007, AOL reverted Netscape's website to a traditional news portal, and rebranded the social news portal as "Propeller", moving the site to the domain "propeller.com." AOL shut down the Propeller website on October 1, 2010. Netscape operated a search engine, Netscape Search, which now redirects to AOL Search (which itself now merely serves Bing (formerly Google) search results). Another version of Netscape Search was incorporated into Propeller. Netscape also operates a number of country-specific Netscape portals, including Netscape Canada among others. The portal of Netscape Germany was shut down in June 2008. The Netscape Blog was written by Netscape employees discussing the latest on Netscape products and services. Netscape NewsQuake (formerly Netscape Reports) is Netscape's news and opinion blog, including video clips and discussions. As of January 2012, no new posts have been made on either of these blogs since August 2008. Netscape was notable for its cross-platform efforts. Its client software continued to be made available for Windows (3.1, 95, 98, NT), Macintosh, Linux, OS/2, BeOS, and many versions of Unix including DEC, Sun Solaris, BSDI, IRIX, IBM AIX, and HP-UX. Its server software generally was only available for Unix and Windows NT, though some of its servers were made available on Linux, and a version of Netscape FastTrack Server was made available for Windows 95/98. Today, most of Netscape's server offerings live on as the Sun Java System, formerly under the Sun ONE branding. Although Netscape Browser 8 was Windows only, multi-platform support exists in the Netscape Navigator 9 series of browsers. Netscape ISP is a 56 kbit/s dial-up service offered at US$9.95 per month (US$6.95 with 12-month commitment). The company serves web pages in a compressed format to increase effective speeds up to 1300 kbit/s (average 500 kbit/s). The Internet service provider is run by AOL under the Netscape brand. The low-cost ISP was officially launched on January 8, 2004. Its main competitor is NetZero. Netscape ISP's advertising is generally aimed at a younger demographic, e.g., college students, and people just out of school, as an affordable way to gain access to the Internet. Netscape always drove lots of traffic from various links included in the browser menus to its web properties. Some say it was very late to leverage this traffic for what would become the start of the major online portal wars. When it did, Netcenter, the new name for its site entered the race with Yahoo!, Infoseek, and MSN, which Google would only join years later. The original Netscape.com was discontinued in June 2006, replaced by the site that would eventually become Propeller.com. Two continuations of the original Netscape.com portal are available; Compuserve.com, the Web site of Compuserve, and ISP.Netscape.com, the website for Netscape's dial-up discount ISP service, continue to use the Netscape.com layout as it was before June 2006. Of the two, only the latter explicitly uses the Netscape branding. Netscape.com is currently an AOL Netscape-branded mirror duplicate of the AOL.com portal with the URL, replacing the former social news website in September 2007. The social news site moved to the Propeller.com domain, where it stayed until ending operations in October 2010. It features facilities such as news, sports, horoscopes, dating, movies, music and more. The change has come to much criticism amongst many site users, because the site has effectively become an AOL clone, and simply re-directs to regional AOL portals in some areas across the globe. Netscape's exclusive features, such as the Netscape Blog, Netscape NewsQuake, Netscape Navigator, My Netscape and Netscape Community pages, are less accessible from the AOL Netscape designed portal and in some countries not accessible at all without providing a full URL or completing an Internet search. The new AOL Netscape site was originally previewed in August 2007 before moving the existing site in September 2007. Netscape.co.uk now redirects to AOL Search, with no Netscape branding at all. DMOZ (from directory.mozilla.org, its original domain name, also known as the Open Directory Project or ODP), was a multilingual open content directory of World Wide Web links owned by Netscape that was constructed and maintained by a community of volunteer editors. Netscape also has a wide variety of community-based forums within Netscape Forum Center, including its browser's community support board. To post on the forums, users must possess an AOL Screenname account in which to sign in, referred to within the site as the Netscape Network. The same service is also available through Compuserve Forum Center. ^ Mook, Nate (July 10, 2006). "Firefox Usage Passes 15 Percent in US". BetaNews. Retrieved September 29, 2015. ^ "History of SSL at IBM.com". Publib.boulder.ibm.com. Retrieved October 29, 2012. ^ a b "America Online Inc. Completes Acquisition of Netscape Communications Corp.". Business Wire. March 17, 1999. Retrieved July 1, 2012. ^ a b "What's $10 Billion to AOL?" Archived November 7, 2017, at the Wayback Machine. Morningstar. April 5, 1999. Retrieved July 1, 2012. ^ "Mozilla Stomps Ahead Under AOL". Wired.com. Archived from the original on June 3, 2014. Retrieved October 29, 2012. ^ "Netscape Launches Groundbreaking Netscape 6 Browser". netscape.com. December 13, 2001. Archived from the original on December 13, 2001. Retrieved October 29, 2012. ^ a b c Tom Drapeau (December 28, 2007). "End of Support for Netscape web browsers". Netscape Blog. Archived from the original on January 3, 2008. Retrieved September 13, 2014. ^ a b c Tom Drapeau (January 28, 2008). "Netscape Browser Support extended to March 1st". Netscape Blog. Archived from the original on February 7, 2008. Retrieved September 13, 2014. ^ "FORM 10-K". Sec.gov. Retrieved October 29, 2012. ^ "Amended Statement by Foreign Corporation". March 16, 2012. Retrieved September 9, 2018. ^ "AOL will pull the plug on Netscape's tech support". Los Angeles Times. December 29, 2007. Retrieved May 18, 2014. ^ a b c Adam Lashinsky (July 25, 2005). "Remembering Netscape: The Birth Of The Web". Fortune Magazine. Archived from the original on April 27, 2006. Retrieved September 13, 2014. ^ a b c Zook, Matthew A. (2005). The Geography of the Internet Industry: Venture Capital, Dot-Coms, and Local Knowledge. Oxford: Blackwell Publishing. p. 104. ISBN 978-0-631-23331-2. ^ a b "OPSWARE INC. / On the record: Marc Andreessen". SFGate. December 7, 2003. Retrieved July 24, 2012. ^ "Cisco tablet not an iPad knock-off: Chambers" Archived March 28, 2014, at the Wayback Machine. Network World. June 30, 2010. Retrieved July 1, 2012. ^ "Mosaic's Name Change". The San Francisco Chronicle. November 15, 1994. p. B3. ^ Clark, Jim; Owen Edwards (1999). Netscape Time: The Making of the Billion-Dollar Start-Up That Took on Microsoft. St. Martin's Press. pp. 160–170 . ISBN 978-0312199340. ^ David Sheff. "Going Public as Netscape Did, before making a dime in profits". Wired 8.08. Lycos. Retrieved July 14, 2006. ^ "Electric cars: A Netscape Moment?". Economist.com. February 4, 2010. Retrieved May 18, 2014. ^ "Is commercial spaceflight's "Netscape moment" near?". The Space Review. July 30, 2012. Retrieved May 18, 2014. ^ "Programmer's Bookshelf". Dr. Dobb's Journal. December 1, 1999. Retrieved May 18, 2014. ^ "Netscape's Marc Andreessen". Time Magazine. February 19, 1996. Retrieved February 3, 2007. ^ "Government alleges illegal campaign by Microsoft". Archived from the original on July 8, 2006. Retrieved July 14, 2006. ^ "Memoirs from the Browser Wars". Archived from the original on May 17, 2008. Retrieved July 14, 2006. ^ Alex Lash. "Netscape cuts prices on retail products". C-Net. Retrieved February 23, 2008. ^ Alan T. Saracevic (October 23, 2005). "Silicon Valley: It's where brains meet bucks". San Francisco Chronicle. Retrieved May 18, 2014. ^ a b "Microsoft Subpoenas Bad Attitude". Wired. September 1, 1998. Retrieved July 14, 2006. ^ "AOL buys Netscape for $4.2 billion". ^ Yoffie, David B. (April 1999). "Building a Company on Internet Time: Lessons from Netscape". California Management Review. ^ "Sun-Netscape Alliance Announces New iPlanet(TM) Brand and Marketing Campaign". Retrieved July 7, 2012. ^ "PCMag". Retrieved November 14, 2015. ^ a b "Sun Micro To Double Beijing Software Center" Archived November 16, 2004, at the Wayback Machine. HPCwire. August 8, 2003. Retrieved July 1, 2012. ^ "Netscape Internet Software Updated". Archived from the original on June 23, 2006. Retrieved July 14, 2006. ^ Gonsalves, Antone (December 28, 2007). "AOL Kills Netscape's Future, Leaves Firefox to Battle IE". Informationweek.com. CMP Media LLC. Retrieved December 29, 2007. ^ "Whatever happened to Netscape?". Engadget. Retrieved March 22, 2017. ^ "Netscape Navigator Gold 3.0 Now Available, Adding Momentum to Netscape Client Software". Archived from the original on October 20, 2012. ^ "AOL to End Support for Netscape Browser". Washington Post. PC World. December 28, 2007. Retrieved September 29, 2015. ^ "Netscape Death is long overdue, Good for Security". Retrieved January 2, 2008. ^ "it's about time. r.i.p. netscape browser". Archived from the original on January 1, 2008. Retrieved January 2, 2008. ^ "Save Netscape Petition". Archived from the original on January 16, 2009. Retrieved January 2, 2008. ^ "Save Netscape!". Retrieved January 2, 2008. ^ "Internet Archive Wayback Machine". Web.archive.org. April 6, 2008. Archived from the original on April 6, 2008. Retrieved October 29, 2012. ^ a b "Propeller.com Spinning to a Stop - Search Engine Watch (#SEW)". Search Engine Watch. Retrieved October 29, 2012. ^ "AOL Takes Over Majority of Microsoft's Ad Business, Swaps Google Search For Bing". ^ "GetNetscape Home Page". Retrieved March 20, 2008. ^ "Netscape Launches Low-Cost Internet Access Service". ^ Netscape late to leverage traffic - CNET News. News.cnet.com. Retrieved on 2013-09-08.